The Type 4 Heavy is a Japanese tier 9 heavy tank. The Type 4 Heavy or just simply called Type 4 has bit different design compared to earlier Japanese heavies. It has much thicker overall armor, and it has completely different guns; it no longer carries similar 10cm guns or 15cm Type 96 howitzer like them, but has whole new bunch of huge naval guns. Compared to O-Ho, it no longer carries miniturrets that limits frontal depression. It also has very thick tracks that are effective at absorbing damage. While Type 4 has much thicker side armor than predecessors, its cheeks on hull are now noticeably weaker than frontal hull armor. Combined with the fact that ammorack is located behind them, Type 4 isn't still good at sidescraping. Furthermore, its heaviest tank in the line (160 tons) but carries the same 1200 HP engine, which makes it even slower than other tanks on the line. All of its guns have dreadful rate of fire, accuracy, DPM and gun handling. Type 4, while slow and clumsy, can be relatively respectable opponent due to its huge guns and thick armor. It shares few traits among with its brother, Type 5 Heavy, which prepares the player for it. However, it has few extra weaknesses compared to its brother, such as weaker cheek armor, noticeably weaker turret armor and much worse soft stats on its guns. The Type 4 Heavy leads to the Type 5 Heavy. - Thick tracks that counts as thick armor can absorb shots effectively. - Choice of two guns; both of them has huge damage potential for tier 9, as 14cm has highest AP damage of all tier 9 heavies while 15,2cm is capable of oneshot most of tier 7s and many tier 8s with premium HE! - Flat armor makes it very vulnerable to tier 10 and many tier 9 gold rounds and TDs in same and higher tiers. - Huge and weak ammorack can be easily damaged from side and from hull cheeks (122mm can one-shot it). 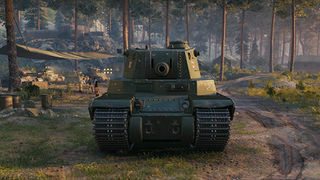 Arguably one of the worse tier 9 heavies in the game, the Type 4 boasts incredible armour and alpha damage for it's tier. Staying near cover is a must considering its one of the biggest tanks in the game, making sure to not get hit by TDs, which often have enough penetration to go through the armor of Type, and artillery. Avoid going open areas as much as possible because this tank's camo value is laughably poor. Gun has poor dispersion, very long reload, aim time and mediocre gold penetration, meaning that you need to fight enemies as close as possible. Mobility is very poor though; worse than Maus, so you need to predict few minutes to ahead and have good map awareness to minimize chances to get left in behind. Avoid sidescraping, since hull cheeks are weak and has ammoracks located behind them. Instead, come out from corners by angling your hullfront and hiding hull cheek behind the corner. This is safest option since your lowerplate is as tough as front. Never go alone, because Type is big, slow and has very long reload. High alpha damage makes this tank relatively good at peek-a-booing. Having allies is again must to make you less vulnerable during your reload. Hulldown option is also usable with -10 degrees of gun depression. 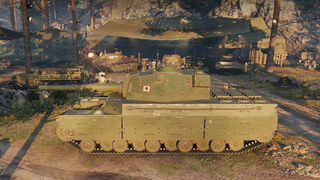 Lastly, you can reverse sidescrape unlike your big brother, Type 5 Heavy, since Type 4 entire rear can be covered behind buildings, exposing only your side and turret. Overall, Type 4 can be relatively frustating tank to play due to size, poor mobility and very poor gun stats apart from damage and regular AP penetration, but on few situations, the tank can do its work very well. Engine is carried over from earlier Japanese heavies, mount it immediately. 14cm doesnt need tracks if you dont have ANY equipment; however in order to mount equipment and 14cm, tracks are necessary. You can go first for 14cm and remove equipment until you get improved tracks, or get tracks first and then get 14cm. After that, you can either go for Type 5 Heavy or research 15,2cm gun. Keep on mind that researching 15,2cm will immediately elite the Type 5 Heavy, and it can be mounted immediately on Type 5 if it has been researched on Type 4. The information below consists a lot of speculation about the mysterious Type 4 Heavy. The O-I super-heavy tank was sent to mobility tests in 1943. The vehicle however suffered issues in the mobility tests, which resulted in termination of the project. Fate of the O-I prototype is still unknown. However, it was apparent that Japan didn't want to give up with super-heavy tank designs. This most likely resulted into developing a new super-heavy tank design. Somewhere in 1943-44, a project of a new super-heavy tank started. In 1944, it was apparent that USA would eventually reach the mainlands of Japan. For this reason, a lot of more advanced tanks such as Type 3 Chi-Nus were saved for this what was seemingly possible "last fight". 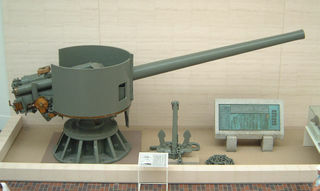 In addition, Japan had other solutions and ideas for this possible event, such as mounting a 12cm naval cannon on the hull of the Chi-Ha, serving as a simple AT-weapon. In addition to this, a super-heavy tank was designed, likely originally meant to be used as a coastal defense weapon against US army. This tank is referred as "Type 4" (and also sometimes somewhat inaccurately as "Type 2604"). The actual full designation is unknown, though since the vehicle was a 2nd super-heavy tank after the O-I, it is possible that full designation was "Type 4 O-Ro", "Second super-heavy tank", but there is no evidence of this designation being actually used. The main difference compared to the O-I was the lack of multi-turret design. At this point, it was widely accepted that multi-turret concept doesn't work, and Japan was no exception. The main turret, instead of being shaped like hexagon, was shaped similarly to medium tank designs like Chi-To or Chi-Ri. Interesting feature of the turret was the periscopes. The main armament was likely a 14 cm naval gun, commonly used on coastal fortifications, which given the intended role of the vehicle as moving bunker was logical option. The Type 4 had two 12 cylinder BMW marine engines with a rather complicated cooling system of three radiators per engine and one oil radiator, cooled by two central massive ventilators, powered by the drive train. The air is sucked in via massive grilles, positioned in the center over the engine compartment. The main advantage of the design was high protection of the engine from overheating. The suspension is seemingly torsion-bar type, similar to German Tiger I and Panther tanks. The suspension was likely inspired by them after all, since Japan bought one Tiger I and blueprints of the Panther for future tank production. The turret was built and assembled somewhere around 1944. Instead of being used against US Army, it was sent to Manchuria and mounted on a bunker on Koto Fortress, meant to be used against Red Army. Nothing is known about the hull of the tank. 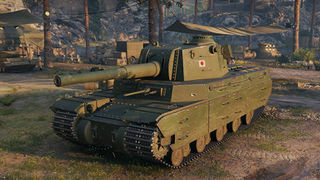 It is possible that some of the now outdated information about the "O-I 120t" (or O-Ho in-game) might actually refer to the Type 4 super-heavy tank. It was rumored that "prototype of the O-I 120t was shipped to Manchuria in 1944". This description does not fit the O-I super-heavy tank, as it was supposedly scrapped around 1943-44; neither does the 200 mm frontal armor nor the 120 tonne weight that was mentioned among with the "120t O-I". If this information was actually about the Type 4, it is possible that the hull had a weight of 120 tons and armor of 200 mm at front. Considering the massive size of the turret and main gun, it is possible that the full weight of the Type 4 in it's full configuration could exceed that of the Maus, which would make it the heaviest tank in the existence. However, what is now false "information" of the "120t O-I" also could be just inaccurate information, and it is very well possible that the hull of the Type 4 was never even built. The turret among with the bunker was found by Red Army in 1945, and it was destroyed. If the hull existed, it is certain that it was destroyed as well. A proposed lighter upgrade, Type 5 (or alternatively "Type 5 O-Ro Kai"), was designed in 1945, but it likely didn't go any further than sketches, most likely due to Japan losing the war. The general information is very lacking; it is theoretically possible that the Type 4/5 never even existed, and the turret was designed as just a fortification turret from the beginning. The only known information about these vehicles comes from Russian sources, with almost nothing about them being mentioned on the Japanese end. It could be thus possible that the sketches and so on were made up by Wargaming, and then with combination of the photograph of the turret could have created two mysterious tanks at tier 9-10 for otherwise problematic Japanese heavy tank branch. However, the turret has distinctly similar features to typical IJA tank-turrets, so it is more likely that it was originally meant for a tank. WG also typically accepts the fact of them creating other fakes such as WT E100 or FV215b, which would make faking the Type 4/5 and then stating that they existed a very weird decision. With current information available, the Type 4/5 will remain one of the most mysterious tanks to the date. 14 cm/50 3rd Year Type naval gun from the battleship Mutsu. 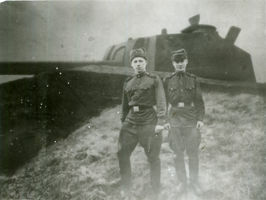 A picture of bunker that mounts a turret from the Type 4, taken by Soviet troops around Koto Fortress in 1945. The rough sketch of the Type 5 super-heavy tank, a proposed, improved modification of the Type 4, detailing the modified engine and cooling system. Notice the differences between the hull shape of the picture between the in-game model. There are no visual images of the hull of the Type 4, however, there is an image of rough sketch of the Type 5. The in-game Type 5 is inaccurately different from the hull on the sketch, so assuming the Type 4 is similar tank visually, it is likely that it's equally also inaccurate in-game. In-game Type 4/5's hull-design is closer to that of mediums tanks like the Chi-To or Chi-Ri, while the one on the sketch of the Type 5 (again, front part of the Type 4's hull is likely very similar) is more similar to that of the O-I. For example, the sketch has no evidence of the tank having hull cheeks. Due to very limited information, some specifics like top speed, weight and armor are all speculation. Armor in especial is very likely thicker in-game than what it actually was, done mostly due to balance purposes. In-game description is somewhat inaccurate. While the Type 4/5 likely shared some design ideas and is possibly even an evolution of the O-I, it most likely is not a direct modification of it. Neither 12.7 or 15.2 cm guns were never proposed to be used on Type 4. The 15.2cm gun had AP shells available, which the Type 4 Heavy lacks in-game. This page was last modified on 2 April 2018, at 15:14. This page has been accessed 73,903 times.